I could never get over how small the castle was! In 1953, Walt wanted to open a park. Not like the dirty, sometimes unsafe parks of the day, but a clean, family environment in a controlled area. He and his creative team (WED Enterprises), put together some ideas on what Walt wanted. He sent a team from WED to Chicago to an amusement park operators convention with his concept, where the "experts" of the day told Disney that he should "Save his money." The park would be too expensive to build and operate, and he should leave the amusement park business to those people who know it. In September of that year, Walt talked Herb Ryman (who wasn't even in Walt's employ at the time), to come into the studios, and create what we'd call concept art of Disneyland's design. That, according to Herb, was at 10am on Saturday. It had to be done in time for a meeting Roy (Walt's brother) was going to have with the bankers to back a 17 million dollar loan to start Disneyland on Monday. They got the loan. Buzz Price located the property in Orange County, where Disney purchased 160 acres from 17 land owners for $720,000, and construction began in 1954. The population of Anaheim at the time was about 15,000, which today would be a very bad attendance day at Disneyland. You can find a year one map here. It was a hot, sunny day in July of 1969. Armstrong and Aldrin had just landed on the moon a couple days before, so it was probably around July 23rd. My family didn't have a lot of money back then, but a particular circumstance has us in California to see relatives that year. Disneyland was *the* ultimate destination for me, especially after watching Uncle Walt every Sunday evening. The Mickey Mouse club was also on WGN every school day afternoon. I'd seen Disney's cartoons and animated features at the theaters. I'd even seen Disney's Nature and Science films at school. So why don't I remember more of that trip? I remember snippets of riding the Matterhorn, Mission to Mars (if indeed that was the one where the seats inflated and deflated), a circle vision film of some sort (I remember the format of the movie, but not the movie itself), Carousel of Progress, and even small parts of Toad and that insidious tune from small world. And the Monorail and the People Mover. But not a whole lot else. Fast forward 36 years, give or take. I'm on my 2005 Desert Southwest road trip, which just happened to get routed through Anaheim. It's almost the halfway point of my trip, and it's definitely the farthest West I'm going. So, it's like, my mid-trip break. And I'm going to do this right. I'm booked in the Grand Californian for three nights. (Hand over credit card. Pretend it's not your card. 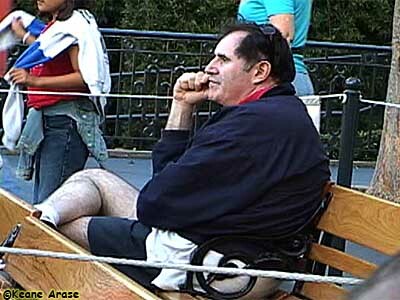 That's using your imagination...) We'll be in the parks 2 and 1/2 days, and I'm armed with a three-day park hopper. I've done Disneyworld in 4 days, this should be a piece of cake. 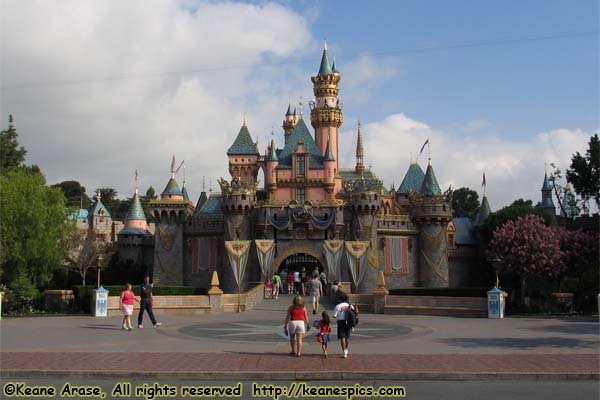 The plan is to go into Disneyland, fastpass Indiana Jones, take a look around, then do the same in California Adventure. (Except for the Indiana Jones part.) So, off to Disneyland. We walk there. The distance is probably shorter than the walk from a resort bus stop at Epcot to Spaceship Earth. Wow. This place is small. As soon as I'm in the gate, the inevitable comparison to the Magic Kingdom in Disneyworld begins. It seems like the same place that's familiar to you, but different. It's a surrealistic experience of a surreal experience. We get on the horse drawn streetcar. It's like in 'It's A Wonderful Life' where George Bailey goes back into town and finds Pottersville rather than Bedford Falls. No, Disneylandophiles (if that's a word), save the hate mail. I don't think Disneyland is the dark side of the Magic Kingdom, and I'm fully aware that without Disneyland, Walt Disney World wouldn't exist. It's what you know, if you know what I mean. But Disneyland seemed...almost claustrophobic, and just too densely packed. Attractions over attractions. I went over the bridge twice trying to find Pirates, only to finally realize that Pirates was down a level *under* the bridge. (Yes, the Pirates at Disneyland beats the snot out of the one in Magic Kingdom.) Having attractions like Alice on two levels was interesting, though. So where was I? Oh yeah. Go and get a fastpass for IJ, and see the original Tiki Room. I guess I have no preference here, it's fun to watch the room come to life in either version. We still have time, let's go see Pirates. Once I finally find Pirates, the line is short enough. How interesting. The opening scene is a restaurant, ala "Gran Fiesta Tour Starring The Three Caballeros" (could they think of a longer name?) the new and improved boat ride in Mexico, Epcot. I admit Pirates at Disneyland is better than the one at Magic Kingdom, but I swear some of the scenes, though duplicated at MK, were in smaller rooms, and didn't have the depth of MK's. We walk around looking at the Rivers of America, and I can't figure out how they show Fantasmic! here. Wish I could see it. Oh well. Is Indiana Jones better than Dinosaur? Hard to say. Like Dinosaur, I'm sure you have to ride IJ a half dozen times before you know what you're looking at. The first time you ride IJ, you're just hanging on at times, since you don't know the story or the vehicle behavior. Jungle Cruise, right next door was a walk on. An excellent CM, maybe better than the ones at MK. 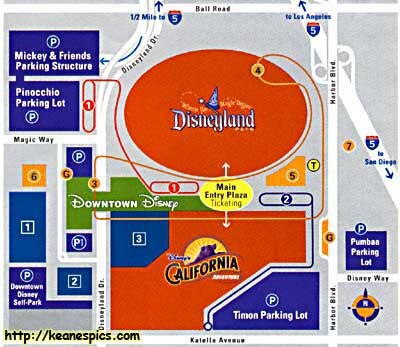 From there, we did Pooh (MK wins there), Pinocchio, Toad, Alice, and then I'm reminded the original plan was to Fastpass Indiana Jones and head to California Adventure. Oh right. Just got a little sidetracked. I'm an Honorary Citizen, and here's my button to prove it! The next morning was Disneyland. I was doing a VISA package, and had entry to Mickey's Toontown Morning Madness, where I could get in and see Toontown before everyone else. Wow. Lots of packages sold by Visa, I guess. Small World was next, and it's really obvious that all the queue lines are outdoor and usually unprotected from the elements. It seemed odd until I remembered I was in a desert. Never rains in Southern California, after all. Makes small world look way different, though. 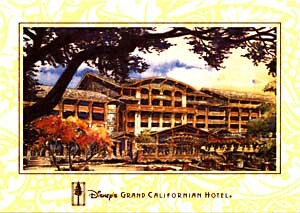 The Grand Californian was described to me as a cross between the Grand Floridian and Wilderness Lodge in Disney World. It's neither. It is, however, in the style of all of Disney's Atrium resorts, (Grand Floridian, Wilderness Lodge, and Animal Kingdom Lodge at WDW), supposedly themed to The AhWahNee Hotel in the Yosemite Valley. It's certainly priced like the Ahwahnee. (No, I didn't stay there, I opted to say down in Wawona. But I digress.) I can say that it's the newest, high-end hotel at Disneyland California. It even has its own entrance to California Adventure. Expensive? Well yes, but so are all the other on-site hotels here. In that respect, Disneyland is more like Universal Orlando, leaving the "cheaper" lodging to the local hotel chains. Sea Kelp and Oatmeal soap? Do I eat it? A shower and snack at the same time? California Adventure is the newest Disney park in the US. It's an interesting park, part Disney's Hollywood studios, part Pro-California propaganda. (Well, okay, the name of the park *is* California Adventure...) I think Disney missed a chance here, they could have shaped the park like the state of California, (it's close, it wouldn't have been hard) with attractions themed to that part of the state.